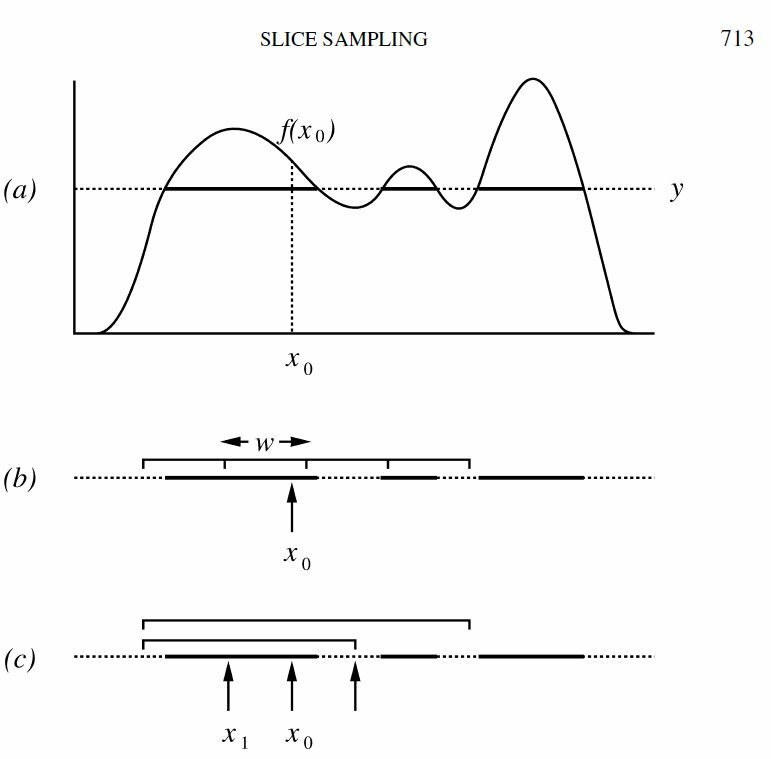 Thanks to an X validated question, I re-read Radford Neal’s 2003 Slice sampling paper. Which is an Annals of Statistics discussion paper, and rightly so. While I was involved in the editorial processing of this massive paper (! ), I had only vague memories left about it. Slice sampling has this appealing feature of being the equivalent of random walk Metropolis-Hastings for Gibbs sampling, without the drawback of setting a scale for the moves. One major theme in the paper is fighting random walk behaviour, of which Radford is a strong proponent. Even at the present time, I am a bit surprised by this feature as component-wise slice sampling is exhibiting clear features of a random walk, exploring the subgraph of the target by random vertical and horizontal moves. Hence facing the potential drawback of backtracking to previously visited places. Overrelaxation is presented as a mean to avoid the random walk behaviour by removing rejections. The proposal is actually deterministic projecting the current value to the “other side” of the approximate slice. If it stays within the slice it is accepted. This “reflection principle” [in that it takes the symmetric wrt the centre of the slice] is also connected with antithetic sampling in that it induces rather negative correlation between the successive simulations. The last methodological section covers reflective slice sampling, which appears as a slice version of Hamiltonian Monte Carlo (HMC). Given the difficulty in implementing exact HMC (reflected in the later literature), it is no wonder that Radford proposes an approximation scheme that is valid if somewhat involved. cannot be computed in an exact manner. Like the “stepping out” procedure. The resulting set (interval) where the uniform simulation in x takes place may well miss some connected component(s) of the slice. This quote may sound like a strange argument in that the move may well leave a part of the slice off and still satisfy this condition. Not really since it states that it must hold for any pair of states within S… The very positive side of this section is to allow for slice sampling in cases where the inversion of u < f(x) is intractable. Hence with a strong practical implication. The multivariate extension of the approximation procedure is more (potentially) fraught with danger in that it may fell victim to a curse of dimension, in that the box for the uniform simulation of x may be much too large when compared with the true slice (or slice of the slice). I had more of a memory of the “trail of crumbs” idea, mostly because of the name I am afraid!, which links with delayed rejection, as indicated in the paper, but seems awfully delicate to calibrate.